With so many different effects your hormones have on you–from making you chatty or quiet, energetic or tired, upbeat or downcast, and the list goes on–sometimes it can seem difficult to get a simple, general idea of how your hormones impact you across your monthly cycle. Think of your cycle as two halves. The first half includes Week 1 and Week 2 (which starts with the first day of your period and ends with ovulation). The second half includes Week 3 and Week 4 (the final two weeks of your cycle before your next period). In the first half of your cycle, rising estrogen gives you an outward energy: In general, you tend to be more outgoing, chatty, social, daring, adventurous, curious about people and events around you and interested in learning about new subjects. You have a greater desire to go out into the world and acquire stuff, such as material possessions, new partners and new experiences, and to rack up personal and/or professional accomplishments that earn you material rewards or that others will pat you on the back for (and be totally envious about). In the second half of your cycle, lower levels of estrogen combined with progesterone give you an inward energy: Generally speaking, you tend to be more introverted, quiet, cautious and introspective, interested in examining your own thoughts, beliefs and experiences. You prefer to stick closer to home and hold onto what you already have, for instance, by looking for ways to save money and connect on a deeper level with close friends, family and your partner. This is a time when you enjoy hunkering down and replenishing your physical and mental energy. And, the activities you undertake in this phase tend be those that nourish your inner self–rather than those that attract attention from others–such as writing, playing music or scrapbooking. Now, these are just general trends. They can be affected by medications, a new job, a new romance, the end of an old romance, stress or other things that often have a big impact on your mood and/or energy. 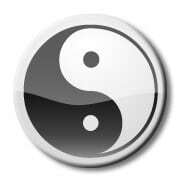 But, on a typical day, this “yin-yang” snapshot is how your cycle is playing out. I hope this gives you a quick overall sense of the natural ebb and flow of your monthly cycle!